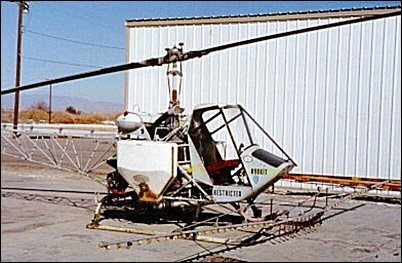 In 1959, Continental Copters Inc. of Fort Worth, Texas, developed and produced a specialised single-seat agricultural aircraft based on the Bell Model 47G-2. Payload is increased by deletion of unnecessary structure and equipment. Known as the El Tomcat Mk.II, this aircraft flew for the first time in April 1959 and received an FAA supplementary type certificate soon afterwards. An improved variant, the El Tomcat Mk.III, made its maiden flight in April 1965 as an improved version of the Mk.II, and subsequent variants were progressively introduced. The Tomcat Mk.III weighs empty 540kg and 1105kg loaded. The El Tomcat Mk.IIIA was flown in January 1966 with 200hp Franklin 6V4-200-C32, 210hp 6V-335-A or a 235hp 6V-350-A engine. The El Tomcat Mk.IIIB of 1967 had a still lower and repositioned windscreen, modified glassfibre nose, lower cabin roof and a 6V-350 engine. The Mk.IIIC of 1968 was an improved version with a 200-235hp 6V4-200-C32, 6V-335-A or 6V-350A engine and was first flown in May 1968. The Mk.V (first flown in June 1968) entered production in 1968 with a 220hp Lycoming VO-435-B1A engine (empty weight 620kg and maximum weight 1105kg), followed by the improved Mk.V-A with a 260hp VO-435-A1F engine and a folding jump-seat to permit carriage of a flagman to distant work sites. The latest version is the 265hp VO-435-BlA-engined Mk.V-B. Max TO wt: 2450 lb. Equipped useful load: 991 lb. Payload max fuel: 817 lb. Range max fuel/ cruise: 81 nm/ 1.3 hr. Max sling load: 844 lb. Engine: Lycoming TVO-435-B1A, 260 hp. Max TO wt: 2850 lb. Equipped useful load: 1321 lb. Payload max fuel: 1147 lb. Range max fuel/ cruise: 50 nm/ 0.8 hr. Max sling load: 1194 lb.